In many countries the bicycle becomes a staple of personal and commercial transportation. Pictures abound with bikes loaded down with immense piles of stuff. In Toronto you get used to seeing them alone, maybe with a child carrier, or carrying small packages with the weaving bicycle couriers. 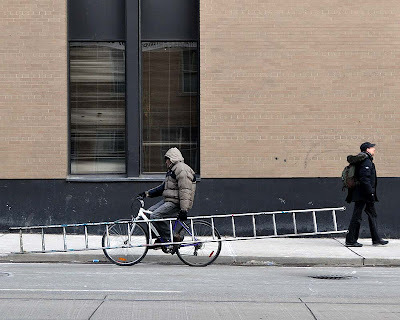 I recently saw one biker carrying a large ladder, riding up Church Street. It was pretty impressive. How balancing activity it is! It is not possible for every one. This guy must be a pro-bike-ladder rider!